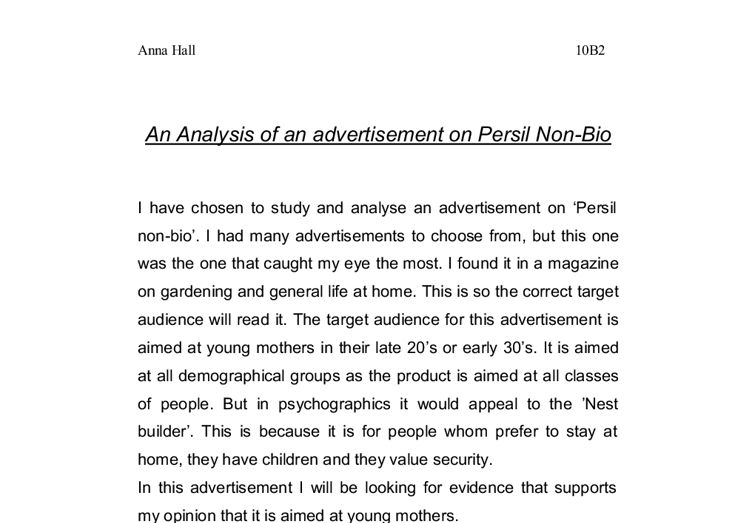 An Analysis of an advertisement on Persil Non-Bio. 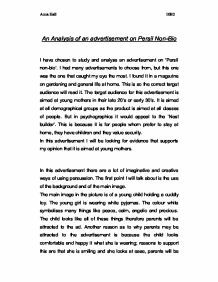 An Analysis of an advertisement on Persil Non-Bio I have chosen to study and analyse an advertisement on 'Persil non-bio'. I had many advertisements to choose from, but this one was the one that caught my eye the most. I found it in a magazine on gardening and general life at home. This is so the correct target audience will read it. The target audience for this advertisement is aimed at young mothers in their late 20's or early 30's. It is aimed at all demographical groups as the product is aimed at all classes of people. But in psychographics it would appeal to the 'Nest builder'. This is because it is for people whom prefer to stay at home, they have children and they value security. In this advertisement I will be looking for evidence that supports my opinion that it is aimed at young mothers. In this advertisement there are a lot of imaginative and creative ways of using persuasion. The first point I will talk about is the use of the background and of the main image. ...read more. For these reasons it would be more appealing to parents of young children, this is because parents of young children are young themselves. At the very bottom of the advertisement there is a badge, which shows that it is safe to skin. It says 'dermatologically tested' on it. This reassures the customer that it is save to skin and that it will not cause any skin conditions. Next to this badge there is a slogan that says 'Because it matters'. This slogan is also reassuring to the customers, as they will think the company, Persil, care about peoples allergies to washing powder. Also alongside the badge and the slogan there is a picture of the product; this is an important aspect to an advertisement as it increases the brand awareness and therefore customers will know what to look for in a supermarket. The advertisement consists of two sections of writing, the first is much more eye-catching than the second as it uses much larger font size and has emboldened certain words in the text. ...read more. This advertisement is extremely effective as it reaches the target audience of young parents by referring to well known fairy tales. Many washing powder companies produce advertisements on 'Non-bio', but this one is more effective to the other advertisements I had as it has words and phrases that would interest parents of young children. This is a way of gaining loyalty and trust from the customer. Advertisements use similar ways of selling or persuading the target audience to buy the product. Many techniques are used in advertisements, * Colour * Font * Logo * Picture of product * Comments or proof that the product is what it says * Slogan * Text describing the product Many companies all try to get into the head of the target audience to produce an advertisement that really appeals to them. This is the most important thing to remember to make an advertisement. In this advertisement I have found clear evidence that it is aimed at young mothers, the little girl is one of them as she may appeal to mothers as they would want their own children to be like her. Anna Hall 10B2 ...read more. Decode the representational symbols in an advertisement which is selling alcohol. They have done this to create the effect of the viewer being at the gambling table with the five cards in front of them. uses this information to locate a greater number of locations for distribution. On the other hand, the newspaper is distributed equally throughout the United Kingdom and Republic of Ireland as it is difficult to discriminate a particular area in terms of sales. The verticality of the word can be iconic of someone standing up. One can almost see in one's mind a person standing up in aggressive opposition in order to voice their opinion. This adds further meaning to the catch slogan 'Find Your Voice' in which the word 'NEVER' has taken a stance to voice its autonomy. The headline uses a persuasive technique, it tells us that arms controls are tough enough when the reader knows its not. The fact, 'the UK boasts the second biggest arms exports in the world', this fact makes the reader feel guilty when the arms exports are coming from the country they live in. As you will see, all of these words are in a much larger font. This persuasive technique is very effective because the first thing the target audience notices when they look at the advertisement is the large text because it stands out most. the reader because they are at the same level of eye contact. The photo underneath the latter one is of the same young boy but with many variations. This boy is smiling cheerfully showing a mouth full of bright white teeth.